Every winter, almost 10 miles above Earth, manmade compounds are destroying ozone at a rapid rate, according to new findings released at the spring meeting of the American Geophysical Union in May. Atmospheric scientist Darin Toohey of the University of Colorado at Boulder and colleagues have observed the breakdown of CFCs at latitudes higher than 50 degrees in the lowermost part of the stratosphere (upper atmosphere). People, with a few exceptions, thought that nothing was happening at these latitudes and these altitudes. We thought this was a region of the atmosphere where in fact these kinds of chemical reactions would not be occurring, Toohey says. Scientists historically have looked at higher altitudes, because water particles, necessary ingredients for the ozone-destroying reactions, were thought to be hard to come by at these lower altitudes. Using an instrument he designed that collects data aboard an aircraft flying at about 40,000 feet and aboard balloons, Toohey measured chlorine monoxide, a compound that destroys ozone. Its one of the breakdown products of CFCs, the one that people often call the smoking gun. If you see it, it means ozone destruction is occurring, Toohey explains. Seeing the chlorine monoxide at these relatively low altitudes was surprising because the region is 20 degrees warmer than the well-known Antarctic ozone hole, located about 13 miles up. Cold temperatures make it easier for the chemicals that are the precursors to the reactive forms of chlorine to stick to the particles, thus initiating ozone destruction. The connection between temperature and ozone depletion relates the research to global climate change. When carbon dioxide increases in the atmosphere, it actually cools the upper atmosphere. Therefore, as the atmosphere continues to change, so too will ozone depletion, Toohey says. Also significant is that the ozone loss is occurring in atmospheric regions that are in greater communication with middle latitudes. The chemical reactions that are occurring here are occurring in a leaky part of the atmosphere, Toohey says. That means the air can readily leak to lower latitudes, having a greater influence on the air over our heads. The high latitude measurements Toohey and his team took cover a region from central Canada to western Russia. Although the coverage was not global, Toohey says, we have no reason to believe that the situation would be any different at different longitudes, same latitudes, he explains. The stratosphere tends to be uniform at any given latitude. This research really begs us in the scientific community to look at lower stratospheric ozone depletion. And, for the person on the street, it makes a strong connection to global climate change, Toohey says. Lake Vostok, Antarcticas largest subglacial lake, has a small clone, scientists announced at the spring meeting of the American Geophysical Union in Washington on May 28. While recently scouring over ice-penetrating radar data collected in the summer of 2000 over East Antarctica, Anahita Tikku of the Lamont-Doherty Earth Observatory at Columbia University discovered an anomaly. 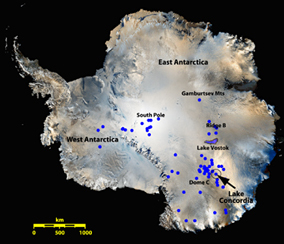 Previously considered one of Antarcticas many smaller, 2 to 3 square-kilometer subglacial lakes, Lake Concordia actually measures at least 800 square kilometers. While nowhere near the size of Lake Vostoks 10,000 square kilometers, the newly identified Lake Concordia shares similar features of basal freezing. Four thousand meters of ice cover the lake. But as the continental ice sheet flows across the long axis of Lake Concordia, the ice sheet appears to thin by 150 meters  indicating areas of potential accretion, where the surface of the lake has frozen to the bottom of the ice sheet. Such areas of accretion in Lake Vostok provide scientists a means of sampling the subglacial lake without actually penetrating through the ice to the lake water itself, an event many fear might contaminate an otherwise untapped environment.